Now that October is in full swing, I’ve been updating my wardrobes a little to make way for some shiny new clothes. Luckily for me, I love all the shades of dark: black, navy, brown, maroon… so I’m halfway there anyway with a rich Autumnal wardrobe. Those of you who know me will know I love nothing more than dresses. I live and breathe them, and would easily wear one everyday if I had enough to get me through, week after week. So you’ll not be surprised to hear I’ve added two new dresses to my clothing collection, which I’m currently overly happy with! 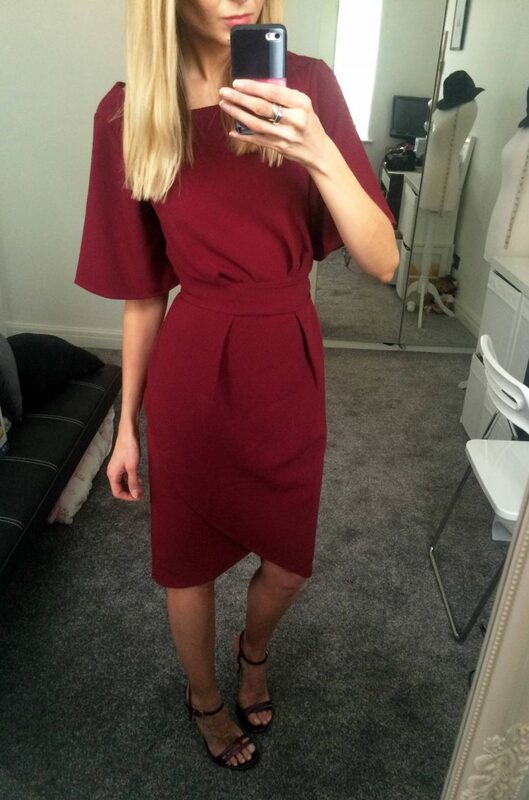 This deep Red Tied Waist Kimono Sleeve Drape Dress, from Closet London, is my ultimate fave. I find batwing sleeve and kimono style details to be really flattering for any body shape. I’m fairly petite but this style doesn’t drown me – it just accentuates my small features without looking too ‘over-sized’. I also feel a batwing sleeve kimono style outfit flatters larger body shapes, as it sits stylishly on the arms without clinging, but also without looking like a baggy fit. Paired with metallic open toe heels, this dress is the perfect outfit for upcoming Christmas parties or evening occasions. I could also team it with a pair of chunky ankle boots and tights, and wear it for work during the day. That’s what I love about a good dress; how versatile they can be. For £55, it’s a wardrobe staple for me! Outfit number two is thanks to one of my all-time favourites: boohoo.com. And not just because they are based in Manchester, but I do admit I love a great local company. I turn to boohoo constantly due to their on-trend fast fashion items which are always priced affordably, especially when it comes to dresses. On this occasion, I opted for a dress that again is versatile, as I can wear it with bare legs and heels for a party, or layer it up with a cute casual op underneath, and dress it down. Here, I layered up a frill sleeve white bodycon top with this frill detail fitted dress. I’ve also teamed it up with a fantastic mocha colour belted shawl coat and open toe block heels in a faux-suede material. Excuse the bare legs, but that aside, I’m Autumn-evening ready!